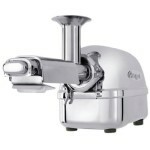 The Omega J8005 Nutrition Center Single-Gear Commercial Masticating Juicer is a slow-speed juicer, which means that it keeps the juice at a colder temperature throughout the entire process. Since none of the parts spin at a high speed – and consequently create heat – all of the enzymes and nutrients present in your fruits and vegetables are preserved! 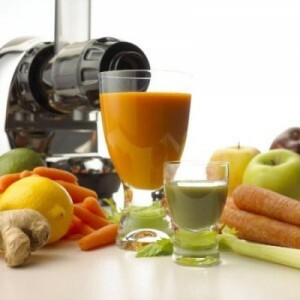 This gives you fresh juice that tastes healthy and refreshing and you can try out all those delicious juicing recipes. Juicing at a lower speed also helps to prevent the oxidation process from happening too suddenly, so you can store your juice for up to 72 hours while still retaining the majority of its nutrients and fresh taste. Seriously, who doesn’t love a kitchen gadget that doubles – or triples – as something else? This allows more cupboard space for your other kitchen items of importance. You can use this juicer as a food processor, a pasta extruder, and a grinder. A pasta extruder!! I bet that’s one machine you would have never thought to buy, but doesn’t it sound fun? You can easily mince garlic, grind your coffee beans in the morning or make your own soy and almond milk, all with this one versatile machine. This is extremely helpful for those of us who have tiny kitchens and far too many appliances (not that I’m speaking about myself or anything…) You can’t complain about saving space! You know all of that pulp you collect while juicing? It can be packaged, frozen and saved for other recipes. Add it into breads, muffins, soups; you imagine it, you can make it! You can even dehydrate it with some of your favorite spices to make juice pulp crackers! The possibilities are endless. Because the Omega Nutrition Center is a single gear masticating juicer, it produces very little froth, and very dry pulp. This means that you are getting the most liquid possible out of your fruits and vegetables, and since so many are needed to make a glass of juice, this can help you save some money in the long run!This commercial grade juicer has a built in reverse button, so if you do happen to have some clogging, the reverse button will solve that issue. If you have a significant other or roommate who wants to sleep without all the racket from your juicer, look no further. 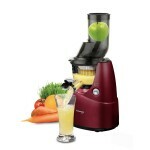 This juicer is much quieter than its high-speed versions, and certainly won’t disturb anyone’s peace while it’s on. You can wake up in the morning and make yourself a nice, refreshing glass of fresh juice without disturbing anyone else in the house! 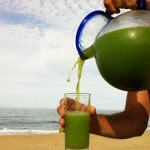 Many juicers on the market simply can’t get enough juice out of leafy greens – and I’m all about my leafy greens. An entire bunch of kale for less than half a cup of juice? No thank you. Since I love to add greens into almost all of my juices and I love experimenting with my juicing recipes, it’s important that I’m getting the most bang for my buck. 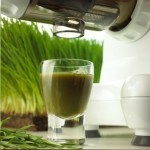 Plus, I have the opportunity to add in some chlorophyll in the form of wheatgrass for extra nutrients! If you’re only looking to juice soft fruits, you probably don’t have much need for a machine that specializes in harder vegetables and greens. 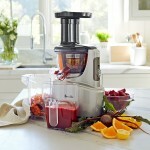 But if you think you’re going to want that option in the future – this is the perfect juicer for you. juicer that is engineered to last a lifetime. Low speed of 80RPM’s stops foaming, clogging and heat buildup.